Millions of women with female pattern hair loss (FPHL), or androgenetic alopecia, may be able to regrow hair faster by using the FDA-cleared iGrow Hair Growth System along with minoxidil (5%). This is compared to using either method individually, concludes a recent study published in Lasers in Surgery and Medicine Journal. Eighty million men and women in the United States suffer from genetic hair loss, including FPHL, which is the most common form of hair loss in women. Led by researchers from Cairo University and Ain Shams University in Cairo, Egypt, the study evaluated the efficacy and safety of low-level light therapy (LLLT) in comparison to minoxidil and to a combination of both therapies in the treatment of FPHL. Forty-five adult female patients, aged 25 to 49, suffering from FPHL were randomly divided into three different treatments groups. The first group applied topical minoxidil twice daily; the second group received three, 25-minute iGrow LLLT treatments per week; and the third group combined the two therapies. Patients using the combination of LLLT and minoxidil experienced the fastest and most significant results according to the Ludwig hair loss classification, and had the highest degree of self-reported satisfaction. In the combination group, a significant increase in the number of new hair follicles was evident after only two months–two months sooner than in groups using only minoxidil or only LLLT. In addition, after four months, hair follicles in the combined therapy group were observed at a deeper dermal level compared to those in the other two groups, meaning they are more firmly anchored and have a higher probable sustainability rate. The study concludes that, as a single treatment, LLLT “is comparable with a slight upper hand” over minoxidil. The iGrow is a hands-free, home-use LLLT device that is clinically proven to promote hair growth when used for 25 minutes, three times a week, for four to six months. Previous studies using self-administered red light treatments with the iGrow showed significant improvements for pattern baldness in both women and men after just four months, leading to FDA clearance. Apira Science, Inc. has pioneered low-level light therapy (LLLT) for over a decade. 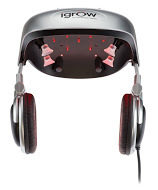 It draws on its expertise and innovations in the application of LLLT to develop hands-free, home-use LLLT solutions, including the iGrow Hair Growth System (www.igrowlaser.com) and iDerma Youth Restoring Masque (www.idermaskincare.com).